You know how at the end of each episode of Inside the Actor's Studio the star being interviewed answers the same ten questions? One of them is, "What sound or noise do you love?" A friend of mine has the best answer ever for that question: the purring of a cat. She says it's a lovely sound on several levels, not the least of which is that it exemplifies complete and utter contentment. 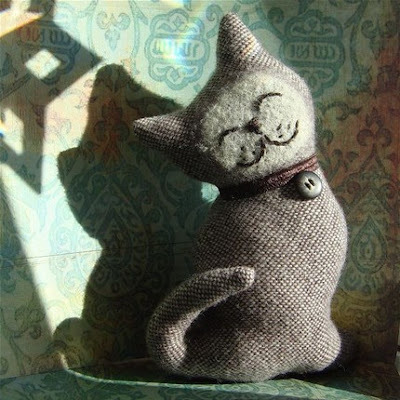 This little stuffed cat, from Marjji's Etsy store, is a purr if I've ever seen one. I love the happy expression on his face, and his little button tag on his collar.